Modern slavery is both global and local. In the past two decades we’ve started to recognize modern slavery as a global issue, and to understand that exploitation exists in many different cultures and societies. But we think less often about what this means for our local services and daily life. In legislative terms, the momentum to address modern slavery and human trafficking has never been greater. In theory, slavery is illegal in every country, and 186 states have domestic laws addressing human trafficking, although nuanced investigation shows that gaps remain in relation to internal trafficking, slavery, forced labour and servitude. 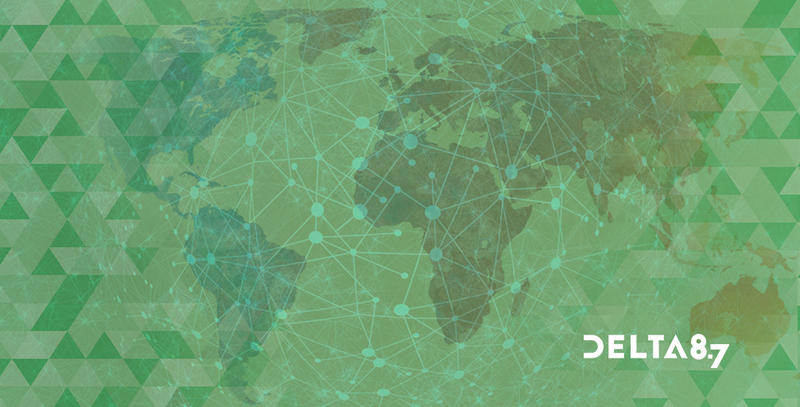 Networks between NGOs, political, business and faith actors are also starting to connect disparate social action agendas through initiatives such as Alliance 8.7 and the Global Freedom Network. However, development of coherent anti-slavery policy at the sub-national and local level is frequently ignored or underfunded, and sometimes constitutes a missing link in the implementation of legislation. Why do we need a local focus for anti-slavery action? Similar to other global challenges, such as climate change, modern slavery requires local action to underpin international and domestic legislation. Efforts to prevent slavery, discover victims and provide support for survivors draw upon a complex web of services provided by sub-national government, law enforcement, faith organizations and NGOs working at the locality-level. The 2018 Trafficking in Persons report also highlights how communities can be part of the policy solution to problems of modern slavery and trafficking, for example, by acting as eyes and ears for law enforcement or providing a supportive environment for survivors. But communities can just as easily form part of the problem, if cultural and economic practices—such as the mistreatment of domestic servants, or hostile attitudes towards migrants—contribute to normalizing exploitation. Diverse leadership for the anti-slavery agenda within communities is therefore important to enable positive action and address potentially harmful practices. At the University of Nottingham’s Rights Lab we have been exploring what underpins effective local anti-slavery action through our Slavery-Free Communities programme. Our research has included national mapping of anti-slavery partnerships across the UK, in collaboration with the UK’s Independent Anti-Slavery Commissioner (IASC). Regional action-learning has explored how we can more effectively construct an evidence base to improve local anti-slavery interventions, and we are also working alongside statutory and community partners towards creating a slavery-free Nottinghamshire. This “place-based” approach to addressing slavery is receiving increasing attention from a number of other cities in the UK and internationally, for its potential as a means to join up fragmented initiatives and promote increased momentum. Research has shown that frontline actors emphasize the importance of building partnerships in order to create a system-wide overview of anti-slavery action. UK police forces reported more than 40 sub-regional multi-agency partnerships in the UK in 2017, despite there being no dedicated funding or guidance from government on how partnerships should be configured. Police respondents were clear that they could not act effectively on the anti-slavery agenda in isolation from other agencies, in part due to the complex inter-agency connections required to provide effective victim and survivor support, as well as enabling prosecution. Yet despite this widespread recognition of the need for partnership, there was less clarity on what actions partnerships should most usefully pursue, as well as how to locate funding for joint work. This absence of resources and coordination in the UK has resulted in an inconsistent patchwork of partnership development, sometimes prompting non-governmental partners such as NGOs, private consultants and churches to step into convene joint action. We also uncovered an urgent need to improve data sharing, monitoring and evaluation to reflect a “whole systems” perspective encompassing the work of all partner agencies. For instance, in the UK we currently understand little about survivor journeys, from the route into exploitation to the point of discovery, and then through experiences of different forms of support. Such information would assist with improving prevention of slavery and promoting detection at the local level, as well as shaping support services. Partnerships were also concerned that they lacked examples of good practice to inspire their work, and prevent re-invention of the wheel. In response to this research we have recently launched a collaborative anti-slavery partnership toolkit, which includes a library of resources, governance documentation and training packages to facilitate further multi-agency action, and we welcome further contributions. We aren’t yet at a place of understanding exactly what best practice looks like, but we can do more to share innovation and action in a joined-up way. Although multi-agency work is a part of the puzzle, changing personal and cultural practices will also be important to building a society that is sustainably slavery-free over the long term. This implies a need to learn from existing awareness-raising campaigns and to develop more sophisticated strategies of co-production and behaviour change in the future. For instance, is it possible to work with communities and local businesses to encourage a culture of fair work, which does not depend on regulation and enforcement? 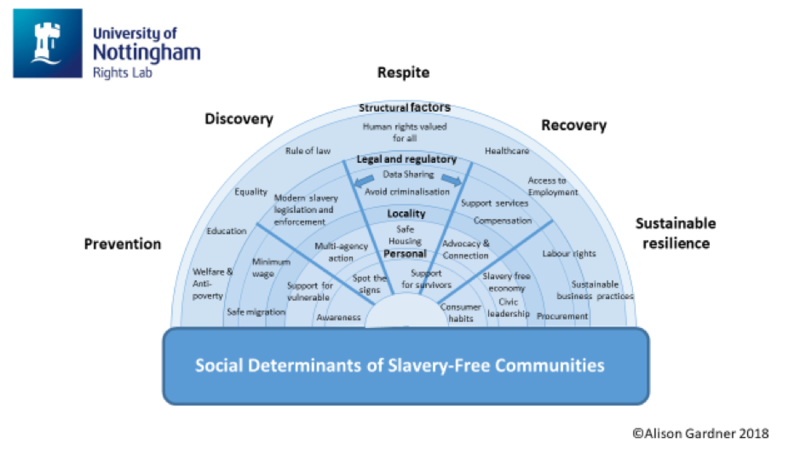 Building on Dahlgren and Whitehead’s model of social determinants of health we have started to theorize social determinants of slavery-free communities (see figure 1) setting them in context with a systemic view of the anti-slavery agenda, that stretches from prevention through discovery to respite, recovery and sustainable resilience. This framework also recognizes that locality-level action is underpinned by personal behaviours on one hand, and legislative and structural influences on the other. The framework requires further testing, but eventually we hope that it might assist with analysis of the components required to develop slavery-free communities in diverse social and economic contexts. Ultimately, if we can understand the factors contributing to slavery-free communities, we’ll be able to measure and compare resilience across a wide range of local settings, with the hope that an index of this type might both challenge and inspire communities to further action.